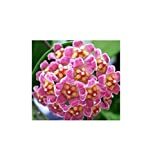 Hoya for sale – You can usually buy a Hoya plant for sale in the form of cuttings taken from top growth or leaves. This cutting will start to produce flowers in 2 years or less. Other forms available are propagated by layering. Layers mature faster than cuttings. Hoya plants are tropical plants and they are pretty simple to care for and maintain. The hoya plant blooms in the late spring to summer. However, unlike other plants, they resent pampering, hovering, and constant handling and moving. Once you picked a location, make sure it will be its permanent home. They make perfect indoor plants since they do not require direct light to thrive but will benefit by placing them near a window. Direct light can burn its leaves due to the heat. Use a cotta pot instead of plastic containers for your hoya plant. You can also place a pebble tray under its pot to increase humidity. 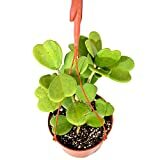 This plant thrives well in a moist, well-drained, light soil with some added perlite. You could also use African Violet soil for your hoya plant or create your own mix of organic potting soil, fine fir bark compost, and worm casings. Keep the soil moist in spring and summer and keep it dry during the winter as they will go semi-dormant during this time. 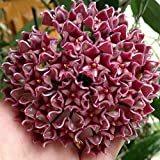 During its blooming seasons in spring and summer, it is ideal to expose your hoya plant in medium to warm temperatures. Keep the soil moist especially in the spring and summer. More frequent watering may be needed in areas with dry climates. 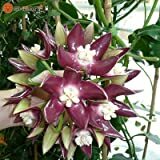 You can also mist the leaves of the plant with water to increase humidity but avoid doing this when your hoya plant is budding or in bloom. Lack of water will cause foliage to brown around its edges and possibly leaves will drop. Feed your hoya plant in spring with a liquid balanced food every four weeks. Do this 3 – 4 times during the growing season to produce a vigorous growth, but withhold feeding during winter to give way for the plant’s dormancy. When it comes to pruning, resist the temptation of removing the knobby spurs produces by the flowers. These spurs should stay on the plant even after the blooms are spent because the plant will eventually grow new buds on these spots. You may use a pair of hand-held pruning shears and cut at an angle in between the leaves, just below a node. Never remove more than a third of the plant’s total growth. If you want to propagate your hoya plant, there is no need for multiple plants in your garden. They are asexual plants; you can propagate through root or stem cuttings. Create cuttings that are at least 10 centimeters long and should have 2 – 6 leaves. Remove the cuttings from the matured plant during the early spring to give it time to take root while in growing season. Hoya plants are one of the easiest household plants to care for. 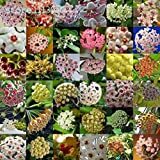 Although they are exotic, proper knowledge and skills can increase the chances of successfully growing a beautiful hoya plant in your home.